Asma Menon - an artist living and working in chennai was born in chennai in 1961, she is a BSC graduate from the Visual communication govt.college arts and crafts,Chennai. She has done her Masters (M.A) from Fine arts, govt .college arts & crafts,Chennai . Address : J35A, 1st Floor, 7th Street, Anna Nagar (East) Chennai - 600 102. 2005 Quatro - 4 Artists of Chennai- Art World- Chennai. 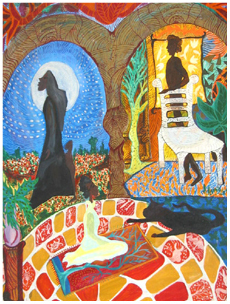 2004 - Contemplations- women artist of India-Gallery Sara Arakal, Bangalore and Habitat Centre, New Delhi. Feminine Eye- Gallery Sara Arakal, Bangalore. 2003 - Chennai Artists-Forum Art Gallery-Chennai- Inaugural Art Show-Gallery Sara Arakkal-Bangalore- Anniversary Art show- Art World- Chennai. 2002 - Annual show of the Cholamandal Artist Village as an Invitee- Chennai • Save the Child curated by Gallery Beyond-Mumbai • Affordable Art - Vinyasa. Art Gallery - Chennai. Of Gods Goddesses and Birds - Lakshana art gallery - Hyderadad. 2001 - Affordable art show-Vinyasa Art Gallery-Chennai • 3Women artists-Cymroza Art Gallery-Mumbai • International Women’s Day- Olga Okuneva and Asma Menon-Russian cultural center-Chennai • Works On Paper-Art resource Trust- Mumbai • Regional Art exhibition-Kerala lalit kala akademi-Cochin • Ceramics and Works on paper- Art World- Chennai • 3women artist-Triveni art gallery-New Delhi. 2000 - The Adyar Art Club, Chennai • Working Artists, Lalit Kala Akademi, Chennai. 1999 - Art in Spring, Cymroza Art Gallery - Mumbai • Masters in Fine Arts, Lalit Kala Akademi - Chennai • Jehangir Art Gallery - Mumbai • One Evening Show, Max Mueller Bhavan - Chennai • Millennium Show of Artists around the country - Vinyasa Art Gallery - Chennai. 1998 - State Department for The Visual Arts, Chennai • 3 Women Artists of Chennai - Art World - Chennai • National Exhibition - New Delhi •Southern Stars - Art World - Chennai. 1997 - All India Fine Arts and Crafts Society, Chennai • Regional Exhibition, Lalit Kala Akademi, Chennai • All India Fine Arts & Crafts Society, National Show - Delhi • 50 Years Of Indian independence , Exhibition On Human Form and Art - Chennai • The Times of India, Cochin - Kerala. 1996 - Cymroza Art Gallery, Bombay • The Regional Exhibition - Lalit Kala Akademi - Chennai • The Sixth Biennial Of Art - Bharat Bhavan - Bhopal • The Values Art Foundation - Chennai • State Department for The Visual Arts Exhibition - Lalit Kala Akademi - Chennai • The Gallery, Chennai. 1995 - State Department for the Visual Arts Exhibition, Lalit Kala Akademi, Chennai - The Gallery, Chennai. 2004 - Substitute Art Teacher for the last quarter at the American International School Chennai for the elementary school level. Also a substitute teacher since 2003 at AISC. The Painted Canopy for young designers-12 to 15years - British Council- Chennai in conjuncture with their Global/Local fashion exhibition at the Forum Art Gallery -Chennai. 2002 - Rotar Club Pondicherry "Art Beat" Children's workshop. First Year post graduate students of fine arts- Stella maris college- Chennai. Workshop on creative expression, which leads to an installation of boxes depicting each student's ethos of work • Potter Around - Children's workshop on collage • Genis Art Foundation and Asma Menon- Childrens workshop on Art, Craft and Theatre. Club Mahindra - Children's workshop - Munnar, Karala. 2000 - Collage, Colour and Storytelling, Genesis Art Foundation, Chennai • Lecture of World Art Improvisation Exercises for the Doctors & Technicians of Jeevan Blood Bank and Lister Laboratories • Workshop for children-Gallery Sumukha-Bangalore • Workshop for Children - BOW - WOW club - Chennai • Side and lectue on Southern art trends - Apparao Galleries - Chennai. 1999 - Exploring of Colour & Space through Storytelling, British Council, Chennai • Lecture Demonstration for cable (Jaya TV) on the etching process. 1997 - Conducted Children's "Paint The Wall" workshop at Max Muller Bhavan, Chennai. 2002 - Women Acheivers Awards, National Publicity Project. 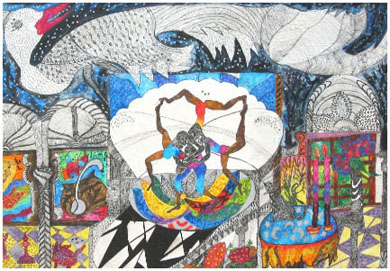 Winner for the category of Visual Arts, Ladies Circle India, Chennai. 2001 - State Award For Print Making - Senior Category. 1997 - All India Fine Arts & Crafts Society Award of Golden Jubilee of India's Independence - State Level, Chennai.